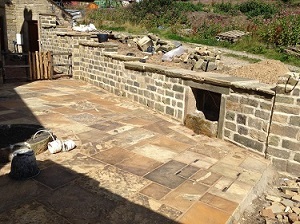 This summer we have just completed phase 1 of a large design and build project in Mytholmroyd, West Yorkshire. 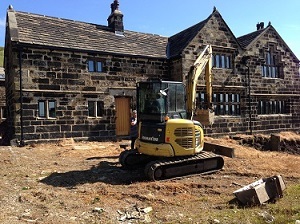 Work commenced on the grounds of a Grade 2* listed property with a history dating back over 400yrs. 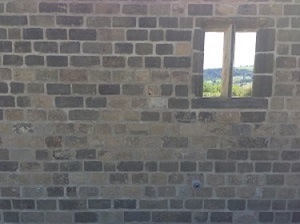 A challenging site in a stunning location with breath taking views. Reverting back to the masterplans and original sketches, a sympathetic build to tackle 3 entrance spaces adjoining the property began. 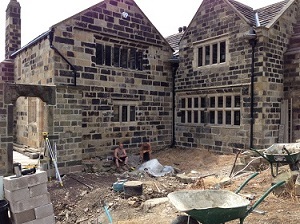 Work focussed on the front of the property, courtyard to the rear and side embankment from the parking area. We had over 250m2 of hard and soft landscaping to resolve, requiring a hose pipe that was over 80 m long just to cover the immediate grounds. 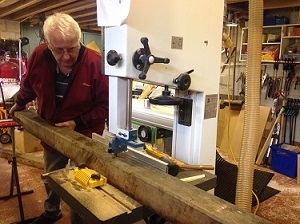 A mammoth task not for the faint hearted. Excavating, levelling, installing drains and foundations kicked of the project. 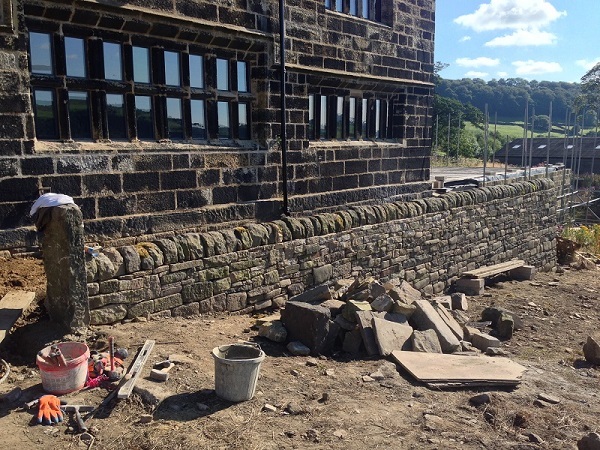 We salvaged architectural relics, paving and walling stone from around the site. We reused local oak timber posts for fencing and gates then demolished the old piggery for its lintels. 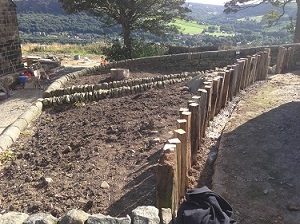 Work on wet and dry stone boundary walls and setting out the base levels followed. This put the scale and size of the job into context. 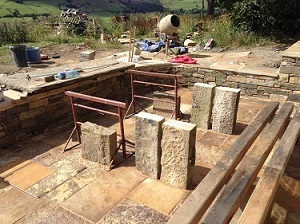 We sourced new riven Yorkshire Flags for the paving, and rehoused the water trough and cast iron post box into the retaining walls. Slowly things started to take on some charm. We salvaged the original roof flags and lintels from a dilapidated out-building for a table and bench and covered over 60m2 of facing walls and over 100m2 of random paving. With the backbones and layout resolved after 6 weeks, preparation for the softworks, soil conditioning, planters, benches and pointing followed. 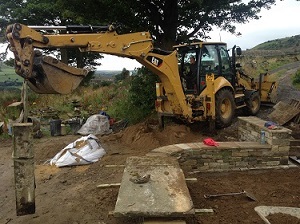 Todmorden based bespoke furniture maker Hugh Stansfield and the local farmer Stephen and his JCB provided additional help. 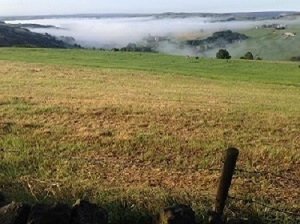 With encouragement and dedication from the clients Anne and Ian (and of course Bronte the Dog), realised by the relentless drive and vision of Evoke; Jonny, Stu, Ruben and Kristan, an elegant piece of Yorkshire has been rekindled. A herbaceous and grass based planting scheme, along with Pinus, Betulas and Prunus trees helped settle the building and garden into the wider landscape. 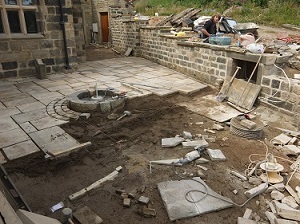 This softened the mass of stonework and brought back some wildlife to finish the project off (for now!) See portfolio for final pictures.